Sealaska Heritage Institute (SHI) has published two new culturally-based children’s books that reflect the Native worldview. The latest releases in its Baby Raven Reads series include the ancient Haida story The Woman Carried Away by Killer Whales and the Tlingit storyThe Woman Who Married the Bear, adapted by Frank Henry Kaash Kataase. 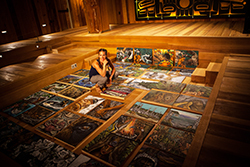 Both books were illustrated by Haida artist Janine Gibbons. SHI will release the new books at a book signing this Friday, Oct. 6, from 4:30-8 p.m. at the Walter Soboleff Building in Juneau during First Friday. Gibbons’ original paintings for the books will be on display and available for sale. Gibbons and Katasse will sign books during First Friday, which will also feature artists Ronnie Fairbanks from Klawock and Karen Stepanenko from Pelican. This First Friday will be the last chance for people to see SHI’s Alaska Native mask exhibit, which will close this fall. The books follow on the heels of 15 other Baby Raven books SHI has published since 2016. The institute plans to publish three additional books in November, bringing the total number of books published during the three-year program to 20. All Baby Raven books are distributed free of charge to families enrolled in the program. They may also be purchased at the Sealaska Heritage Store and online. The new books will be available for purchase on Oct. 6 at the book signing. Raven Reading: A Culturally Responsive Kindergarten Readiness Program is funded by an Alaska Native Education Program grant from the U.S. Department of Education: CFDA # 84.356A, PR# S356A140060. Though the pilot program ended in August 2017, SHI recently received funding to continue Baby Raven Reads for an additional three years. The Woman Carried Away by Killer Whales: When a woman is carried off by killer whales, her husband embarks on a journey to get her back. Aided by friends he meets along the way, the man follows her trail across the bottom of the sea to the Killer Whale House. Find out what happens to Nanasimgit and K’uljáad in this ancient Haida story. Illustrated by Haida artist Janine Gibbons. The Woman Who Married the Bear: In this ancient Tlingit story, a woman who has insulted the bears while out berry picking meets a bear in human form. They fall in love and get married. Soon, the woman’s brothers come looking for her and the woman learns her husband is not what he appears to be. Text adapted by Tlingit writer Frank Henry Kaash Kataase. Illustrated by Haida artist Janine Gibbons.